I’ve become a serious lover of Mexican culture over the last few years. After my trip to San Miguel de Allende I promptly came home and redecorated my bedroom with textiles and goodies I found in the artisan market there. So when a trip to Oaxaca landed on my radar I was all in. Elsie proposed the idea after her gal pal Rachel had mentioned wanting to go - and I was over the moon excited when she specifically suggested the idea of taking a Thread Caravan trip. Thread Caravan is run by my New Orleans friend Caitlin - who I already had been chatting with before Elsie even mentioned it. In the meantime Elsie and I had been working on finding a reason to travel together - so it seemed the universe was conspiring to bring the whole adventure together: a girls trip to sunny Oaxaca was in order! The moments from this experience will live forever in my memories: ancient ruins, artistic hideaways and so many special connections with the indigenous women we had an opportunity to meet. 1. Education: we visited several Zapotec women’s cooperatives - artisans continuing ancient traditions and creating space for women to work and share their art. We visited natural wonders to learn about the plants and environment - and then a mezcal distillery too. 2. Fun: One of the things I love most about my work is having the opportunity to travel with girlfriends! Caitlin makes her home in Oaxaca now, and she was the best tour guide. Emma joined Elsie, Rachel and I — these girls made for the best traveling partners. I’m sharing a snapshot of our itinerary - and I want to preface this post with this: we were there for 4 days and every single moment was curated by Caitlin. You could follow my itinerary, but honestly, the trip was as special as it was because of Caitlin and our guide Ilan. The education we received was a result of Ilan’s vast knowledge of the community and culture, Caitlin’s knowledge of the women’s co-ops and the meetings that she arranged that allowed us to connect on a deeper level. So - here we go! Enjoy the photos and the recommendations (I’m not giving the itinerary exactly - we dined at Caitlin’s home for example, and I can’t guarantee you’ll have the same chance to do that 😉), however if you’d like to experience a trip like this - a trip with Thread Caravan is the way to do it. 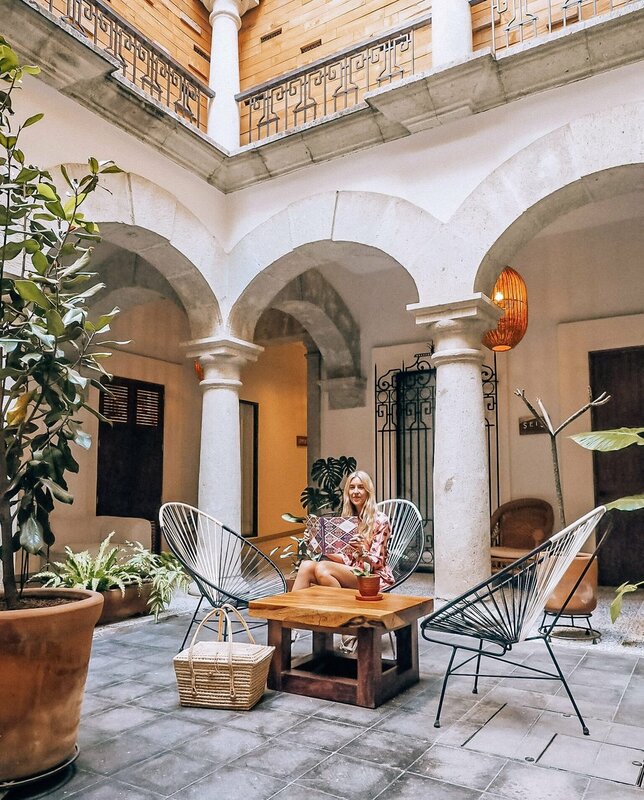 Where to stay: Casa Antonieta - a colonial style boutique hotel with a stunning interior courtyard. Elsie and I shared Suite 1 which faces a bustling main corridor of Oaxaca. The natural light in the room and gorgeous textiles made it such a relaxing space to come home to each day. Where to Dine: Boulenc - the photo below says it all. Bread straight out of the oven, super fresh ingredients, locally made kombucha and ginger ale… everything on the menu was so good we went back twice. Also on our itinerary: a night of street food (I alway love getting elote - there’s some videos of our street food night in my instagram story highlights) and a beautiful evening at Criollo. Here’s where it gets good! We had three days of exploring experiencing everything from incredibly empowering indigenous women working in their cooperatives to natural wonders unlike anything else. Monte Albán - We started by venturing to Monte Albán to learn about the Zapotec and Mixtec ruins. Imagine seeing terraces, canals and sacred pyramids literally carved out of the mountain inhabited by a succession of people for over 1,500 years. The ruins are a quick drive from Oaxaca City; make sure to take a walk through the museum at the entrance of the ruins as well to get the full history lesson and see some of the excavated finds. Ethnobotanical Garden - To see the gardens you’ll have to join during a tour - so for us, despite our limited Spanish speaking skills we joined a Spanish speaking tour and made it work. (There’s options for English speaking tours as well). We learned that 1/3 of all plant life in Mexico can be found in Oaxaca - and the cactus plants alone at the botanical gardens were worth the visit! Hierve El Agua - It’s about a 2.5 hour drive to reach the mineral springs and petrified waterfall in the mountains. We swam, sun bathed, made a flower mandala on the bank of the springs (thank you to Raquel of Flores Rudas for that experience). Depending on how long you stay there’s hiking trails around the area if you’ve got time for a full day of adventuring around the springs. Teotitlan del Valle - About an hour away from Oaxaca City, we visited the Vida Nueva co-op to meet the women, hear their story and participate in natural dyeing and weaving demonstrations. Seeing Pastora, the founder of the cooperative - who’s been written about as a human rights and community advocate in the New York Times, work her magic on the loom was so inspiring. I’m a total novice when it comes to plant dyes - and my mind was blown as I watched the women mix up different plants, seeds, roots, nuts and even parasites that grow on the cactus plants to make the colors you see below on the yarn and on this dress we dyed. I took home a run woven by Pastora and a beautiful pillow cover made by one of the other women I met. There’s nothing like meeting the person that made something that will live in your home for years to come. Ceramics visit in San Marcos Tlapazola - We traveled here to meet with the Zapotec Women of the Red Clay. We learned about their ceramics processes and purchased gifts and homewares directly from their shop. When we arrived Rachel asked if she could snap a few photos. We were struck by the women’s beauty, the intricacy of their dresses and how they styled the ribbons in their hair. They agreed to the photos - and then we all got to witness their delight as they watched the photos develop. Each of them had their photo made, and of course we left the photos as a gift for them! It was truly heartwarming - photography can create such a beautiful human connection - this was perhaps one of the most memorable experiences for me. If you’re interested in mezcal take a visit to Los Amantes Palenque to learn about mezcal production and experience a tasting. Even if you’re not a drinker, seeing the rows upon rows of agave plants and the contemporary design of the mezcal making facility is worth the trip. Interested in taking in a bit more art? Visit San Agustin Etla. The art center - built inside a 19th-century textile mill - includes a hydro-electric paper-making facility, as well as photography and textile studios, several grand exhibition spaces and artist housing. The facade of the building is colored with natural dyes - another example of eco-friendly materials like tree bark and plant fibers being put into use. There’s also plenty of shopping - both boutique style shopping, or more local market experiences too - the Benito Juarez market was on our list - although admittedly I was most excited about finding small shops with natural textiles and Oaxacan based designers, and therefore ran out of time for market shopping. For me, travel has enabled me to grow my creativity, get comfortable being uncomfortable, expand my empathy, nourish my mind and body and so much more. I hope this little taste of Oaxaca inspires you to make your own trip. It’s a place I’ll certainly be spending more time! To book a Thread Caravan trip, click through here. 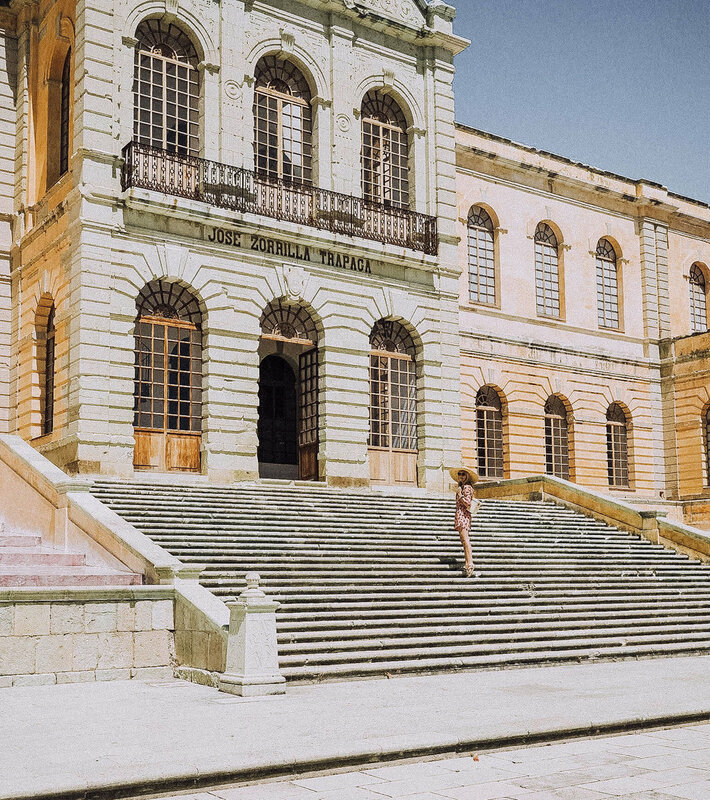 Have questions about how to create your own life as a traveling creative? I’m here for you! Leave me comments or questions below and as always feel free to send a message my way as well.